Amy Handmade Ceramics: Happy Fishes! 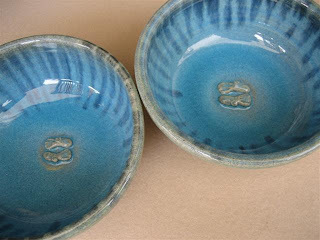 Fresh from the kiln, happy fishes bowls!! I am pisces and I like the fishes I made, they are smiling. Sometimes, I heard people saying "oh, i did it before" I believed it is not what others did that matter me, it is what i did that is important to me. It is true that art required talent, but more it required hard working, it is through millions times work, one becomes an artist; with passion, skill, experience and insight. Bit by bit, i am accumulating and thank you for being with me in this path. 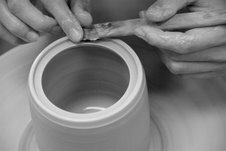 I am a self-taught potter or rather a hobbyist from Finland. I make two kinds of works: I make these cute angles and cats; and "half-naked" women sculptures. I don´t know much about glazes, I sure don´t know how to make them. I have to buy my glazes from ceramic supply stores and there are only two of those here in Finland. I saw your "Happy Fishes" bowls and I fell in love with the glaze, the shade of blue is amazing! I was wondering if You could tell me something about that particular glaze. Have You made it Yourself, how have You fired it in the kiln, could You give me the recipe! ?